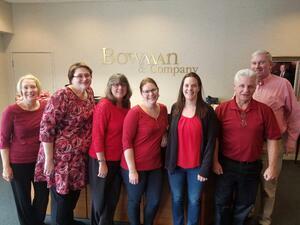 Bowman & Company LLP is once again proud to support the American Heart Association’s (AHA) National Wear Red Day (February 1, 2019). Millions of Americans all across the country wore red to show their commitment to the fight against heart disease in women. Wear Red Day gives Americans the annual opportunity to get the word out to family and friends and to empower them to take action against heart disease. 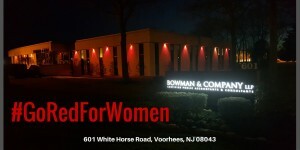 Bowman & Company's Voorhees office will be lit up in red for the month of February, joining a wide variety of other illuminated landmarks, buildings, and properties from coast to coast. We hope you’ll join us in supporting the AHA and helping in this vital effort.